Carnivorous plants have a trapping mechanism designed to catch and digest insects. They do this in part to obtain nutrients not found in the soil. Some, such as the American pitcher plant (Sarracenia sp. ), are native to the United States. The trapping mechanism may work on a trigger, such as is the case with the Venus fly trap (Dionaea muscipula), or it may be a special area of the plant that the insect falls into or becomes stuck on. Nitrogen is vital for a plant's growth and, in particular, the development of the plant's foliage. This nutrient is found in nitrates in the soil. Unfortunately, this nutrient easily leaches out of soil, according to the University of Illinois, especially wet soil. This is why many fertilizers are nitrogen-rich. Plants that suffer from a lack of nitrogen will develop limp, yellow foliage. Although it seems that carnivorous plants should suffer these symptoms, because they grow in nitrogen-poor soil, this is not usually the case. Most carnivorous plants are found growing in bogs. The soil in these bogs is very wet, high in peat and low on nutrients. To survive in such poor soil, carnivorous plants had to evolve to develop a way to get nutrients, including nitrogen, according to the University of Florida. They developed ways to trap and digest insects, which give them the nutrients they need to thrive even when growing in very poor soil. 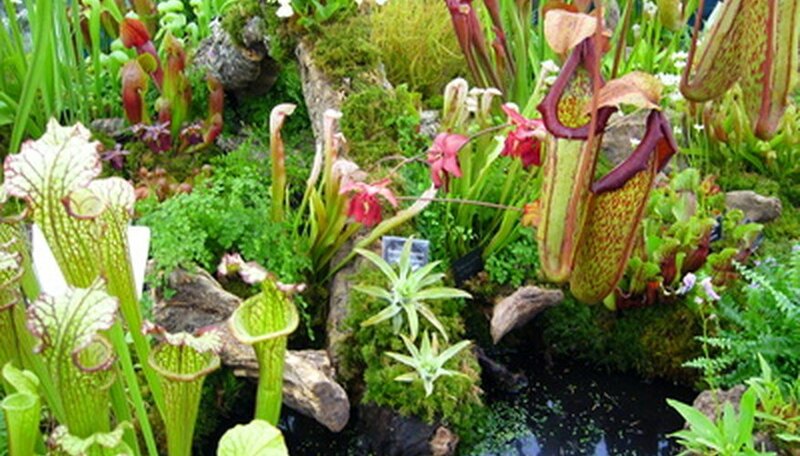 The trapping mechanisms of carnivorous plants are either active or passive, according to the University of Florida. Active traps are triggered by insect movement to "catch" the insect. Passive traps wait for an insect to be lured by the scent of nectar. When the insect lands on the plant, it either becomes stuck or falls into a reservoir filled with digestive enzymes. Insect bodies contain a little over 10 percent nitrogen, according to the International Carnivorous Plant Society. This is enough nitrogen to satisfy some carnivorous plant species but not others. In fact, the percentage of nitrogen in the tissue of carnivorous plants can range from only 20 percent to over 75 percent. Species that need a large amount of nitrogen--such as Drosera, Nepenthes and Sarracenia--might not grow well in nitrogen poor soil. It's not all about the nitrogen. There are other nutrients that carnivorous plants need but cannot find in the poor soils they grow on. Insect bodies also contain potassium, calcium and phosphorous--all essential to the health of plants. Sarracenia in particular needs a good amount of phosphorus, according to the International Carnivorous Plant Society, and is known to absorb it from insects. Many other species are known to get magnesium and potassium from insect bodies as well. These nutrients not only aid in the process of photosynthesis but are sometimes used to build new plant tissue as well.